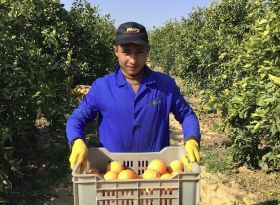 Dutch group Jaguar The Fresh Company has revealed that it is now offering Fairtrade oranges throughout the year, after its Egyptian partner Agroland received ‘Permission to Trade’ in mid-December. This was granted to Agroland following intensive supervision from Jaguar in areas such as food safety, certifications and cultivation methods, and ultimately this will result in the awarding of a definitive Fairtrade certificate. "We, as Jaguar, took the initiative to apply for this certification," explained Pascalle van Bergenhegouwen, quality manager, occupational health and environment at the company. "We are seeing that our customers are increasingly interested in the social side of the sustainability policy," he said. "We are already sourcing Fairtrade citrus from our South African partner and with Agroland we can now offer this all year round. This certificate is a good way of raising the sustainability level higher." According to Jaguar, the process was not a smooth ride all the way and for Agroland it also meant that certain things had to change. “Among other things, employees - outside the management - had to be elected to the Fairtrade Committee, which serves as the official employee representation," van Bergenhegouwen explained. Fulfilling the Fairtrade goals was not simple either. Sven Thomas, quality and food safety specialist, guided the supplier through the process during the past year by being present in Egypt. Paying a Fairtrade premium in a market with tight margins is not without risk. For van Bergenhegouwen, the two aspects are completely independent. The wish has also been expressed internally to set up similar projects for other key products. "The cooperation with our Egyptian partner Agroland is hopefully a step towards more."